Before we get too deep into discussion of Lord of the Rings Nazgul, we must first address the fact that the game is intended to be a semi-cooperative game. That is, there is a sense of teamwork, but an overall winner is declared, so backstabbing and such are common. Thankfully for our purposes today, there is a fully cooperative variant, where the competitive elements are eliminated. Thus, the game does meet our requirements for coverage here at Co-Optimus. Perhaps the most attractive aspect of Lord of the Rings Nazgul is the theme. From the miniatures tothe movie stills on the art to the idea behind the game itself, Lord of the Rings Nazgul is dripping with theme. The idea of playing the bad guys in the War of the Ring is very intriguing, and who didn’t think the wraith-like Nazgul were among the best parts of the movies? To be able to take on the role of one of these fallen kings, teaming up to defeat the forces of good, is deviously alluring. The Nazgul miniatures are large, and satisfying to hold in your hand. 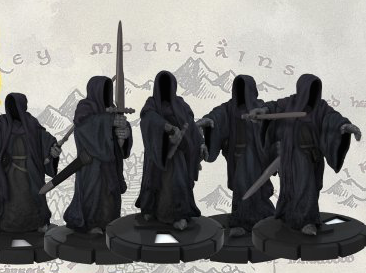 These minis use the Clix system, where the base of the miniature is a dial that can be rotated to show changes in the power level of each Nazgul. I’m a big fan of the Clix system in general, and it certainly makes sense to use it here. As the game progresses, your villainous wraith will grow in strength, and this adds a sense of accomplishment and progression to the experience that I enjoyed. When you move to the central mechanic, however, the appeal of Lord of the Rings Nazgul begins to fade. The cube pulling mechanic is the primary mechanism that drives the game. I don’t intend to get too deep into the rules, but battles are essentially resolved by putting cubes of various colors into the included cup and then pulling cubes out at random. Cubes can represent your forces or opposing heroes and soldiers. When you draw friendly cubes (if any of Sauron’s forces can really be regarded as friendly), good things happen, but when opposing cubes are drawn, bad things happen. I was initially drawn in by this mechanic, as it is fairly unusual, but the appeal wore thin since there really isn’t all that much you can do to affect the outcome of the battle. 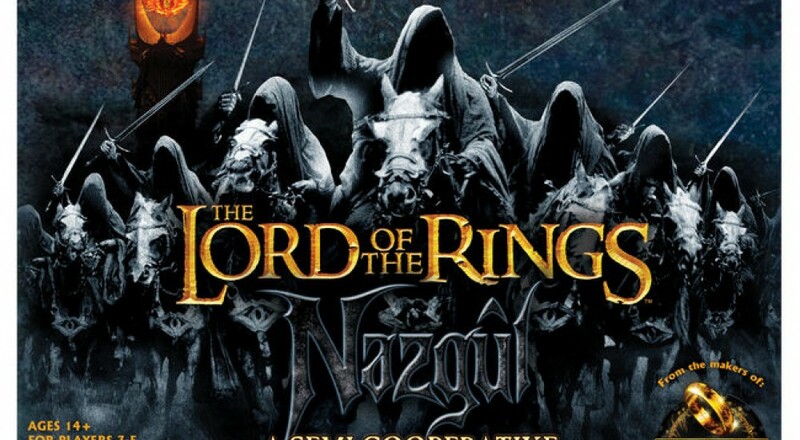 Another serious issue with Lord of the Rings Nazgul is the graphic design. The game board is the biggest offender here. It is simultaneously ugly and confusing. An important part of succeeding in the game is choosing the right battle, and figuring out which battles must be defeated in what order isn’t immediately obvious upon looking at the board. Some sort of color coding would have been far better than the hard-to-notice footprints connecting the battles. The cards are flimsy with text that is too small. The overall design of the various game components seems to get in the way of simplicity and accessibility, and this even affects the otherwise nifty Nazgul miniatures. They are almost indistinguishable from one another on the board. So what about the cooperative elements, then? First we must talk about the semi-cooperative rules. As mentioned earlier, the game is intended to be played in a semi-cooperative way, where the Nazgul work together to meet the common goal of defeating the Fellowship, but also accumulate victory points. Only the Nazgul with the most points wins the game in the end. 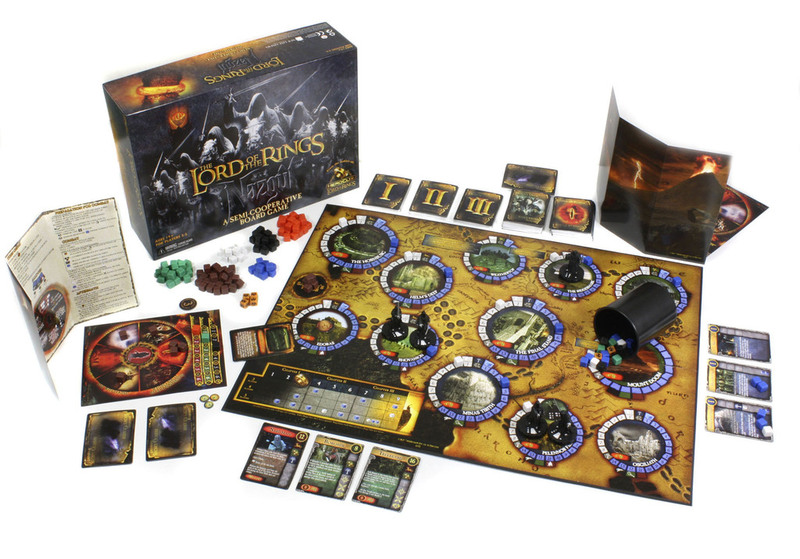 Under this rule set, there is a bidding segment of each turn, where each Nazgul chooses from a list of benefits that Sauron will provide, and chooses which benefits to bid on. Thematically, Nazgul bidding against one another doesn’t make much sense, but it adds an axis of decision making to the game that is lacking otherwise. The full cooperative variant eliminates the bidding segment entirely, and, unfortunately, with it, most of the interaction between players. Without the bidding, all that really remains is going through the motions of the campaign, a series of battles. The battle system is overly complicated, and it boils down to spending several minutes figuring out which cubes to filling the cup with, then, relatively quickly, drawing and resolving each cube. It takes too long and feels very artificial. While it is beneficial to have more Nazgul present in the fight, it feels less like you are helping one another than just sharing a turn. I would rank this as one of the least cooperative games ever covered in this column. It is unfortunate that Lord of the Rings Nazgul has so many flaws, because I really, really wanted to like it. It could have been so cool to team up with your friends to wipe out Legolas, Frodo, and the rest for the glory of the Witch King and Sauron. But there just isn’t enough sound gameplay here that makes it worth getting over the horrible graphic design, base-level cooperation, and overall fiddliness of the cube drawing battle mechanism. The game would have been better as a purely competitive one, though thematically that makes little sense. Overall, Lord of the Rings Nazgul feels like a missed opportunity, and is a far cry from being the one co-op game to rule them all.